LARAMIE, Wyo. — Sometimes, an energized crowd can motivate the visiting team. UNLV senior Tre’Von Willis sensed that would not be the case this time. Snow was falling outside, and a small gathering of about 3,000 fans inside the Arena-Auditorium set the scene for a quiet Tuesday night. "Our coaches were trying to pump us up before the game, because the atmosphere was not that pumped," Willis said. "So we said, ‘We’ve got to bring the noise ourselves.’ "
The Rebels waited until the second half to bring it. Almost lulled to sleep during the first 20 minutes of boring basketball, UNLV awakened to find the inspiration and offense needed to defeat Wyoming, 74-65. Willis, Oscar Bellfield and Chace Stanback each scored 17 points as the Rebels improved to 16-5 overall and 4-3 in the Mountain West Conference. "It wasn’t pretty, but we’ll take it," said Willis, who made three 3-pointers and played 30 minutes off the bench despite a sore right knee. UNLV, which shot 3-for-19 from the field to open the game and 9-for-29 in the first half, trailed 31-23 at halftime. "No one was happy with the first half. I thought we were pretty stagnant," Rebels coach Lon Kruger said. "The second half was quite the opposite." Bellfield and Stanback scored six points apiece as UNLV went on a 14-8 run after halftime en route to its highest-scoring half (51 points) of the season. The Rebels shot 12-for-18 to open the second half and claimed a 44-42 lead on Willis’ 3-pointer with 12:59 remaining. Sophomore forward Quintrell Thomas, who returned to the starting lineup after a seven-game stretch on the bench, threw down back-to-back dunks to put UNLV up 61-49 with 6:32 to go. Thomas hit 5 of 7 shots and finished with 10 points and seven rebounds in 20 minutes. "That was very important. Quintrell had a great game," Stanback said. "He was very aggressive. We know he can score inside." The Rebels, who hit 2 of 14 3-pointers against the Cowboys’ zone in the first half, displayed better ball movement and drove to the rim more after halftime when they scored 24 points in the paint and made 5 of 10 3s. "We didn’t have a choice. We had to come out like that," said Stanback, who shot 8-for-16 but just 1-for-8 from 3-point range. "We know now we’ve got to start getting the ball inside more. Once we started moving and getting guys open shots, the game started to flow a lot better." Sophomore guard Anthony Marshall produced a big second half to finish with eight points, 11 rebounds and five assists. 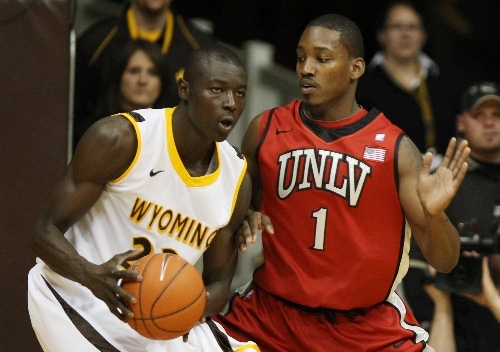 Marshall grabbed four of UNLV’s 12 offensive rebounds. Willis said the Rebels emerged from halftime with a determined attitude. "First of all, we weren’t making shots, and we were shooting too many jumpers," Willis said. "We knew it could go either way. I tried to tell the guys, ‘Hey, keep your heads up. Now it’s our half.’ "
Desmar Jackson’s 17 points led Wyoming (8-12, 1-5). The Cowboys suffered their fourth consecutive loss and next face No. 4 San Diego State and No. 9 Brigham Young. 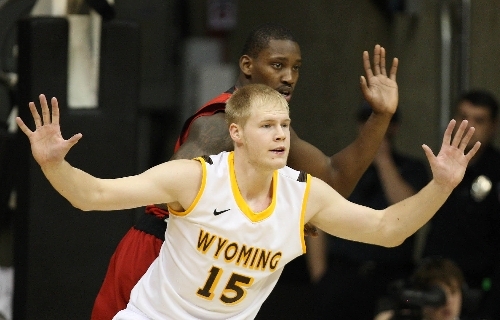 "The league is very unforgiving," Wyoming coach Heath Schroyer said. "UNLV was a Top 25 team earlier this season, and we’re getting ready to play two top-10 opponents." The Rebels get the weekend off before hosting Utah on Feb. 2. "It’s a good way to go into a break," Kruger said. Contact reporter Matt Youmans at myoumans@reviewjournal.com or 702-387-2907. KEY: Down eight points at halftime, the Rebels shot 21-for-32 from the field in the second half.